From January 16, 2017, all guests at Scandic hotels will be able to enjoy complimentary unlimited access to more than 5,000 national and international newspapers and magazines on their mobile devices through the PressReader app. The initiative is another step towards strengthening the digital guest experience. Scandic will be the first hotel company in the Nordic countries to offer this service at all hotels. To further enhance the guest experience and strengthen customer relationships, Scandic is now offering access to newspapers and magazines from around the world, in over 60 different languages, directly on guests’ mobile devices. The initiative is also in line with Scandic‘s long-term efforts to reduce its impact on the environment. “Today, we’re seeing a major shift in the way our guests consume media. To meet their demands and expectations, we’re offering a service that we hope will make their experience smoother and more modern – in an environmentally friendly way,” says Thomas Engelhart, Chief Commercial Officer at Scandic Hotels Group. and guests will be able to download and save as many newspapers and magazines as they like to take home or continue reading on their journeys. To meet the expectations from all guests a number of daily newspapers will still continue to be available at the hotels. “PressReader is experiencing accelerated growth in Europe, and this new partnership with Scandic is an exciting new endeavor for us. 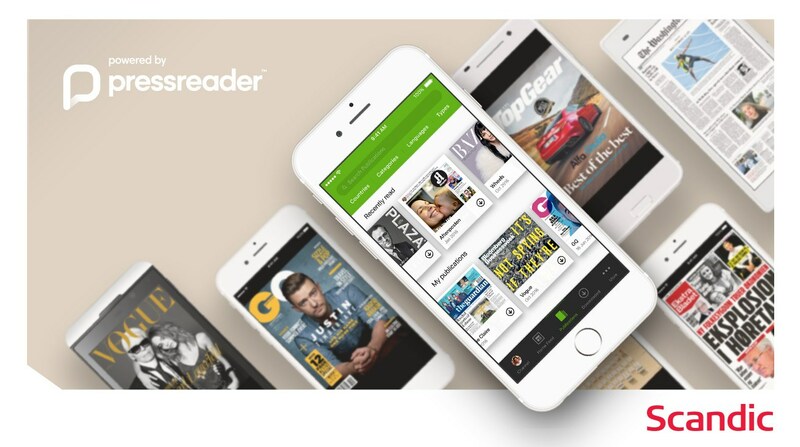 We look forward to offering their guests access to a world of premium newspaper and magazine content on PressReader, says Igor Smirnoff, Chief Commercial Officer at PressReader. PressReader is a platform for people who want to read, share, and talk about the stories that matter to them. We’ve partnered with thousands of publishers in over 100 countries to give readers unlimited access to top-quality journalism around the world. With the PressReader app, 6,000 newspapers and magazines can be read online or downloaded to a smartphone, tablet, or laptop. Readers can subscribe to PressReader, or access our entire collection without a subscription simply by walking into one of thousands of PressReader HotSpots.